Eli’s in Manhattan and it’s sister store, The Vinegar Factory, are a couple of my favorite upscale food haunts. I treat them as tourist destinations when entertaining out of towners. Eli Zabar, aside from being a really great guy, is always on the cutting edge of fine food trends. Across the street from the Vinegar Factory is his bakery where numerous types of delightful breads and pastries are baked daily, including the lovely & tasty mini brioche. Above the bakery, using the heat from it, is a green house where he grows heirloom tomatoes, herbs, baby and micro greens, among other delectables. I was shopping at Eli’s for a TV commercial for which I was hired to food style . I was drawn to a beautiful dome shaped cake of creamy sheep’s milk ricotta perched on a glass pedestal in his exotic and extensive cheese department. Sheep’s milk, like goat’s milk, is easier to digest than cow’s milk, due to their lower lactose content, about half. Sheep’s milk has nearly twice the fat as goat and cow’s milk, making a really creamy and smooth ricotta. Eli’s makes their own. I was compelled to buy a small portion for a taste. It was phenomenal. Prosciutto di Parma is another of my favorite Italian treats. It is often coupled with fresh mozzarella, tomatoes and basil on panini, which is Italian for small breads. Although I don’t usually indulge in pork products because of their high triglyceride content, I occasionally make an exception for prosciutto because it is exquisite. I felt inspired to come up with an unbelievable tiny treat to satisfy my sheep’s ricotta and prosciutto lust. 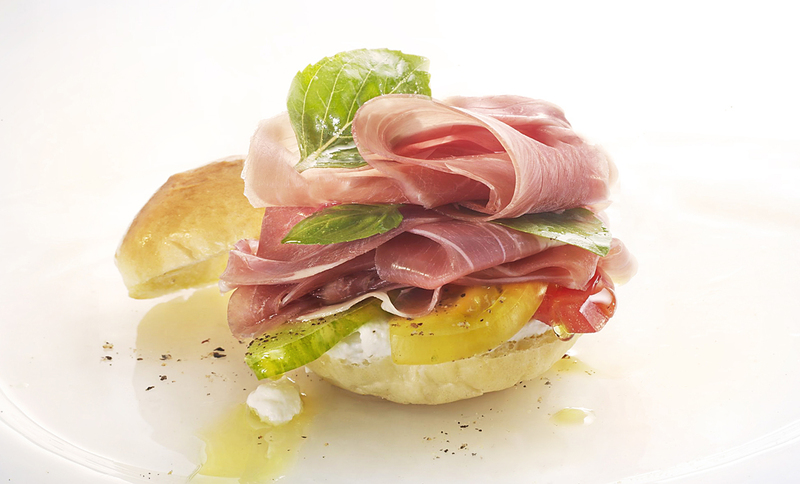 Mini Brioche with Prosciutto, Ricotta, Tomatoes and Basil. Lay three half slices of tomatoes onto ricotta layer of each bun. Sprinkle with pepper to taste. I adore Deviled Eggs. They are one of the ultimate comfort foods. I’ve found that one of most important aspects of making them, as with any egg dish, is not to over cook them. High heat and too much cook time are usually the enemy of eggs, rendering them tough and sulfurous, not to mention unsightly. Superb deviled eggs start with perfectly “boiled eggs”. The thing is, you don’t really boil them. Bring enough water to cover them to a boil, then reduce the heat so that the boil is a mere murmur. Carefully add room temperature eggs into the water all at once with a slotted spoon, making sure they are entirely covered with the water. Set your timer for 10 minutes for large eggs, 9 minutes for medium eggs, and 11 minutes for extra large eggs. I prefer medium sized eggs for deviled eggs because they are the perfect bite size. Have a large bowl of ice water standing by to receive your cooked eggs. Remove all the eggs at once and submerge them into the ice water bath. Peel the cooled eggs under the ice water carefully to keep the whites unmarred. It is difficult if the eggs are too fresh, but if they are too old, the yolks will be off center. 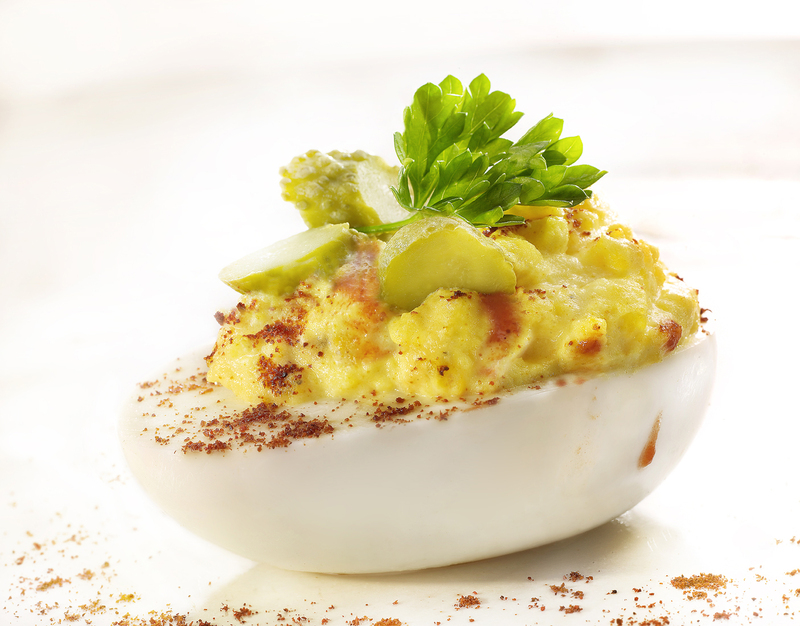 Three days is perfect from laying time for deviled or sliced hard cooked eggs. The yolks should be very yellow in the center and more cooked at the edges. Slice eggs in half length wise with a wire or a very sharp knife. Place egg yolks into a bowl and mash with a fork or a pastry cutter. Mix all of the rest of the ingredients into the yolks except the whipped cream and the toppings. Fold the whipped cream into the yolk mixture. Fill the 16 egg white shells evenly with the creamy yolk mixture with a teaspoon. Top each deviled egg with three slices of cornichon pickles. Sprinkle with paprika, dot with red pepper sauce, if desired, and add a very small sprig of Italian parsley. Enjoy as a breakfast, snack, or party pleaser, or as a side dish for any entree. I was going to visit my friend Doug for fourth of July weekend, and his birthday. I rented a car for the trip to his remote country house. There are no stores near his house for miles and miles. His kitchen has few accoutrements, not even a range. So I did my grocery shopping in the city accordingly. I made sure whatever foods I bought for the weekend needed no other preparation than could be accommodated by a hot plate, electric skillet, sink and refrigerator. We were out to have fun and relax. I didn’t want to make the long journey with a fragile ready-made birthday cake. I wanted something special and easy. I considered the holiday and the colors, the weather and the sensation of summer. In the supermarket, I eyed a naked sponge cake among the piles of fresh, ripe berries. A fast and festive fruit tart came to mind. All of the ingredients can be found in almost any supermarket. Pre-made sponge cakes are usually displayed in the fresh fruit area of the produce aisles. Lemon curd is available in the jam and jelly section, and mascarpone cheese and creme fraiche can be found in the dairy case next to the cream cheese. 8 ounces mascarpone cheese, at room temperature. In a small bowl, whisk together the mascarpone cheese and creme fraiche until smooth. In another small bowl, whisk the lemon curd until homogeneous. In the center of the sponge cake, make a mound of the creme and cheese mixture. With the back of a tablespoon, slowly spread the mixture in a circular motion to the edge of the sponge cake. 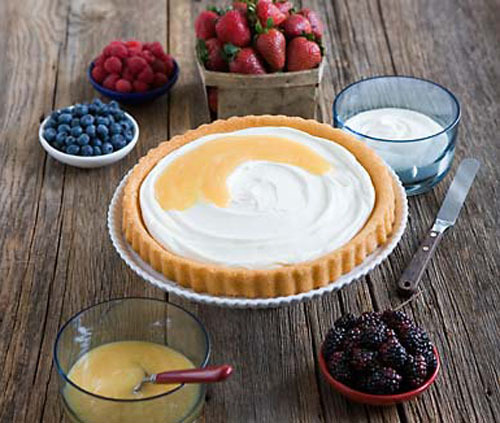 With a clean spoon, carefully apply the lemon curd over the cheese mixture, leaving a small ring of the the creme showing. 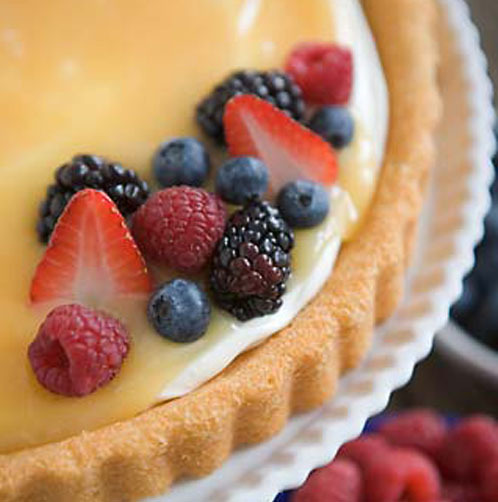 Arrange the berries over the top of the tart, alternating colors and textures. 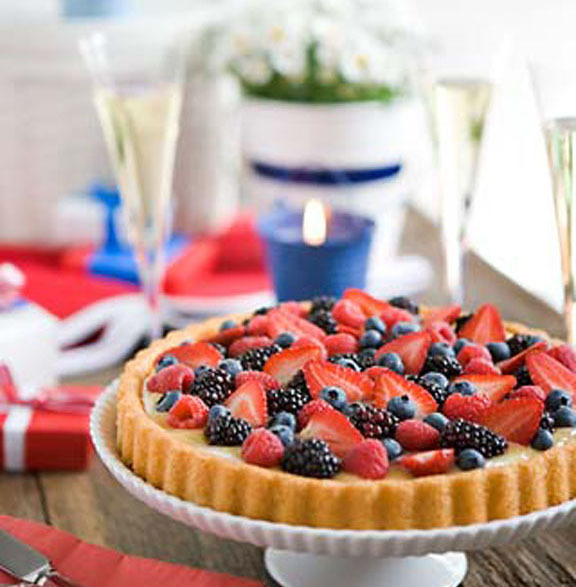 The tart can be prepared ahead and chilled, or serve at once with coffee, tea or champagne. I am always experimenting with food. I was in the farmers market the other day and saw some really great fresh beets with greens attached. I also saw a lovely pile of fresh fava beans in their hulls. I love the idea of not letting anything go to waste, using every bit of food for both flavor & nutrition, and basically saving money. I love beets. Everything about them is good. I think people who don’t like beets are confused by the pickled version in salad bars, that are so one note, though I like them too. Roasted, beets become delectable. It brings out their sweetness and texture. Beets are not only delicious and beautiful but are extremely versatile. The best thing about beets is that they are all get out healthy in so many ways. Just to name a few; they detoxify the liver while having major cancer fighting properties, their high fiber and betacyanin content reduce cholesterol, heart disease and colon cancer. Beets are also known to help combat diabetes. And by the way, they were first cultivated by the ancient Romans, originating in North Africa. I wanted to use all of the parts of the beets and the fava beans and combine them with other elements to make a really delicious and nutritious, and of course beautiful, meal. Beet greens are slightly bitter, much like Swiss chard and are even more nutritious than the beetroot, which is sweet and balances the greens. The stems are colorful like the root and have the nutrition of both, though a little tough, are tamed with the proper cooking. Fava beans, as with all legumes, are high in protein and reduce cholesterol levels in the blood. They are creamy in texture and quite delicious when cooked. The crowning note on this experimental recipe is the way the beets lend their color and flavor to the pasta. I was thrilled as a food stylist. I came up with a Penne Pasta Beet and Fava Bean entree. Separate and wash beet root, stems and leaves. Roast beet roots for 30 minutes in a 350′ oven on a cookie sheet. Let cool. Peel with a knife or vegetable peeler. Quarter and marinate in a one quart bowl with a pinch of salt and a tablespoon of olive oil while you prepare the rest of the meal. In salted boiling water cook fava beans with their hulls separated for 15 minutes, until beans are tender. Drain and discard hulls. Place drained beans into the beet bowl. Don’t throw away the boiling water. You will use it to boil your pasta. Slice scallions and saute on medium low heat in a pan with 2 tablespoons of olive oil for about two minutes. Remove scallions from saute pan and add to bowl of fava beans and beets. Chop beet stems into one inch bits and add to the oil you just sauteed the scallions in with minced shallots and crushed hot pepper for about 5 minutes until tender. 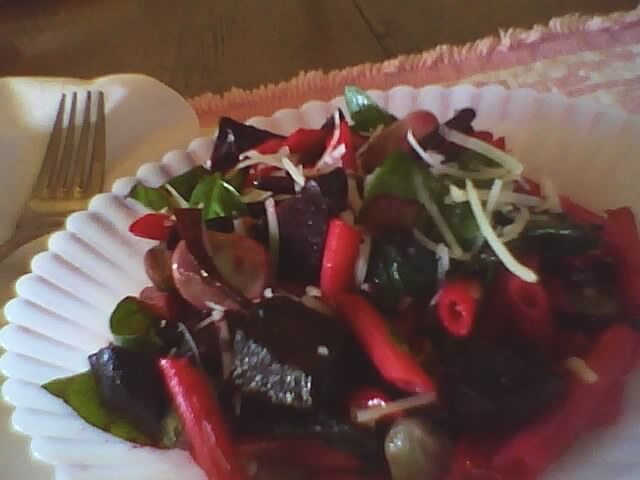 Remove vegetables and place into the bowl with the beans, scallions and beets. Chop beet greens and saute in the same skillet you just used, until tender. Place in the bowl of the other ingredients. Chop basil leaves and add to bowl. Add salt and pepper to taste. An added note. I found brown rice and golden flax seed pasta from Hodgson Mills that is great for glucose intolerant people, and is also a wonderful nutritional ingredient for everybody. Whole brown rice is an excellent source of remedy for arthritis, and flax seed is one of the best sources of omega 3’s, that combats heart disease and is great for any an all skin conditions.